The Best Podiatry blogs from thousands of top Podiatry blogs in our index using search and social metrics. Data will be refreshed once a week. Podiatry newsletter is a comprehensive summary of the day's most important blog posts and news articles from the best Podiatry websites on the web, and delivered to your email inbox each morning. To subscribe, simply provide us with your email address. San Francisco, CA About Blog Welcome to the Podiatry Blog of Dr Richard Blake of San Francisco. I hope that the information here will help you in some way. White Plains & NY, NY About Blog The Center for Podiatric Care & Sports Medicine is a local practice specializing in the diagnosis, treatment, and prevention of diseases of the foot & ankle for children, adults, and seniors. We offer comprehensive treatment of functional problems & trauma of the foot and ankle, fitting & modification of orthotic devices, podiatric sports medicine, and advanced diabetic foot & wound care services. Facebook fans 554. Twitter followers 41. Cyberspace About Blog Podiatry Arena is a forum for discussion between podiatrists and other foot health professionals. Facebook fans 4,884. Twitter followers 8,340. San Francisco, CA About Blog A community for the podiatric physicians, students, and patients of reddit. Facebook fans 1,141,968. Twitter followers 503,333. Philadelphia, PA About Blog The mission of the The Journal of Foot and Ankle Surgery is to be the leading source for original, clinically-focused articles on the surgical and medical management of the foot and ankle. Overland Park, Kansas About Blog Kansas City Foot Specialists provide state-of-the-art podiatric medicine & surgery in KansasCity. We specialize in sports medicine and diabetic care. Facebook fans 344. Twitter followers 457. Belvidere, NJ About Blog Review the foot and ankle care blogs for the expert staff and podiatrists from Pequest Foot and Ankle Specialists, located in Belvidere, New Jersey. Facebook fans 1,906. Twitter followers 1,647. Frisco, TX About Blog At RNV Podiatry we treat a wide range of foot and ankle disorders such as foot pain, ankle pain, bunions, corns, hammertoes, plantar fasciitis, plantar warts and tarsal tunnel to name a few. Rachel N. Verville is an experienced podiatrist and is committed to providing the best possible family-friendly foot and ankle care to patients of all ages. Facebook fans 2,031. Twitter followers 35. Livonia, Michigan About Blog We Treat all Foot and Ankle Conditions. Our practice at Foot HealthCare Associates is built on three principles: trust, caring and a commitment to excellence in podiatry. Facebook fans 1,259. Twitter followers 5. Queensland, Australia About Blog my FootDr podiatry centres are Australia's largest and most trusted podiatry group with 24 podiatry clinics across Australia and Singapore. Facebook fans 553. Twitter followers 1,414. Huntington, New York About Blog Advanced Podiatry is one of the largest Podiatry groups on Long Island. They specialize in bunions, sports injuries, heel pain, ingrown toenails, and laser toenail fungus treatment. Facebook fans 1,864. Twitter followers n/a. Lexington KY About Blog Our mission is to provide the best foot and ankle care for our patients. Lexington Podiatry offers quality, compassionate healthcare. Facebook fans 3,815. Twitter followers 1,569. Portsmouth, NH About Blog Portsmouth Foot and Ankle is the podiatry practice of Dr. Sartori and Dr. Baczewski in Portsmouth, NH. Facebook fans 853. Twitter followers 145. Fort Lee, NJ About Blog Foot and Ankle Center of Fort Lee, LLC cares about the health of your feet. Our podiatrists provide treatment for heel pain, ankle pain, bunions, and more. Facebook fans 84. Twitter followers 10. Tampa, Florida About Blog Read Advanced Podiatry's Educational Blog on all foot, ankle and leg problems. We treat all conditions and specialize in minimally-invasive procedures to help you recover quickly. North Valley Stream, New York About Blog Long Island Podiatry group provides advanced foot care services - surgery, limb salvage, diabetic foot care, pediatric foot problems. Facebook fans 22. Twitter followers 32. Frederick, MD About Blog At Frederick Foot & Ankle Specialists, we are committed to providing the highest quality of podiatric medicine and surgery for each and every patient. Facebook fans 14,467. Twitter followers 804. Parker, Colorado About Blog Learn more about Podiatry Associates, P.C. and their specialties, including fungal nail laser, heel pain, orthotics, and bunion surgery. Podiatry Associates, PC providing quality foot and ankle care to Parker, and Castle Pines Colorado. Facebook fans 232. Twitter followers 984. La Jolla, California About Blog This blog is designed to educate you on foot and ankle health issues regarding foot and ankle. At The Advanced Foot and Ankle Center of San Diego they specialize in the diagnosis and treatment of infant, children and adult patients with medical conditions of the foot, ankle and lower leg structures. Facebook fans 77. Twitter followers 38. Naples, FL About Blog Dr. Kevin Lam is a top podiatrist in Naples, offering all ailments of the foot and ankle, specializing mainly in Reconstructive Surgery. Facebook fans 1,598. Twitter followers 560. Long Beach, California About Blog Find interesting information related to podiatry and foot care written by the podiatrists at Superior Foot & Ankle Care Centers. At Superior Foot & Ankle Center we provide excellent and compassionate podiatric care in order to ensure happy, healthy feet for Long Beach area patients. Facebook fans 760. Twitter followers 28. UK About Blog Podiatry careers advice for those applying to study Podiatry in the UK. Read our top tips for writing a Podiatry personal statement and course funding info. Facebook fans 1,134. Twitter followers 2,987. Erina NSW About Blog Erica Dash, the Central Coast Podiatrist is a family friendly Podiatry Clinic treating a wide range of foot and leg complaints of patients of any age or stage of life. New Jersey, USA About Blog At Associates in Podiatry, we believe that a doctor and a patient become a team for treating an individual’s feet. For more podiatry information, check out Associates in Podiatry blog, where you can find stories on athlete's injuries and general facts about foot health. Facebook fans 55. Twitter followers 61. About Blog Pro Feet Podiatry is a team of passionate and professional Podiatrists and administrative staff who pride themselves on providing the best and most up-to-date treatment. Keep up with their news on the Pro Feet Podiatry blog. Southern New Jersey About Blog At Cornerstone Foot & Ankle, our mission is to create a foundation for your overall health by providing exceptional and comprehensive foot and ankle care tailored to your personal needs. Facebook fans 364. Twitter followers 107. New York, NY About Blog Dr. Ernest Isaacson is a New York City Podiatrist that diagnoses and treats common foot and ankle conditions, such as hammertoes, bunions, calluses, and more. Facebook fans 212. Twitter followers 463. Jessica Boulevard, Minyama About Blog Coastal Podiatry servicing the Sunshine Coast. Foot, Heel and Leg pain specialists. Boutique Clinic on the Sunshine Coast specialising in Medical Pedicures and Luxury Podiatry care. Savannah, GA About Blog Ankle & Foot Associates has been working with patients to provide the best comprehensive podiatric care for patients in Southern Georgia. Ankle & Foot Associates' experience in podiatry is coupled with genuine concern for their patients. Our goal is to help you maintain healthy feet. Facebook fans 59. Twitter followers 60. MI About Blog Hosey Foot and Ankle Centers have locations in Clinton Township, Mount Clemens and Sterling Heights, MI. Dr. Hosey is one of the premier podiatrists in the country who is board certified in foot and ankle reconstruction surgery. Facebook fans 177. Twitter followers 123. Pueblo, CO About Blog We provide comprehensive ankle & foot medical & surgical care utilizing state of the art technology & patient service in an enjoyable and safe environment. Facebook fans 272. Twitter followers 25. Perth Western Australia About Blog Perth Physiotherapy and Podiatry, Discover articles on massage Perth, hydrotherapy Perth and etc. Facebook fans 281. Twitter followers 31. Auckland About Blog Perform Podiatry has been helping the feet of Aucklanders for many years. We provide expert services to people of all ages and stages. We treat all foot and ankle conditions and we are qualified to perform minor surgeries. Facebook fans 617. Twitter followers 22. Subiaco WA About Blog Peak Podiatry is proud to be widely recognized as Perth’s Premier Sports and Family Podiatry Practice. We are a professional Perth Sports Podiatrist practice specializing in the treatment of bone, soft tissue injuries and sporting injuries of the foot and lower limb. Facebook fans 586. Twitter followers n/a. About Blog The Forest Foot and Health Clinic was started in the New Forest National Park 20 years ago by Hilary Nossiter, our senior podiatrist. It quickly expanded to include Physiotherapy, Sports Massage Therapy and Osteopathic treatment. Facebook fans 310. Twitter followers n/a. Myrtle Beach, SC About Blog Get foot care tips from a qualified South Carolina podiatrist in our blog. The goal of Coastal Podiatry Associates is to provide the highest quality of specialized care for problems of the foot and ankle. Facebook fans 710. Twitter followers 1,425. Adelaide, SA About Blog Podiatry First Sports offers general podiatry, ingrown toenail surgery, orthotic therapy, dry needling, mobilisation. Facebook fans 339. Twitter followers 7. Manalapan, NJ About Blog A Step up Podiatry specializes in Podiatrist, diabetic foot care, children’s feet, Heel and Arch pain And Sports injuries in Manalapan NJ. Facebook fans 94. Twitter followers 507. Cottesloe, Western Australia, Australia About Blog Perth Podiatric Surgery is a specialist podiatry practice located in Cottesloe, Perth which offers both non-surgical and surgical treatment for adult and child foot and ankle problems. Facebook fans 517. Twitter followers n/a. Woolloongabba, Brisbane About Blog The Podiatry Practice, covering a range of topics from ingrown toenails, through to diabetic complications and footwear. Grand Rapids, Michigan About Blog Croswell Podiatry in Grand Rapids, MI offers Laser Fungal Treatment, Heel Pain, Neuropathy, and Diabetic Foot Care. Their goal is to ensure you experience compassionate, efficient and cost-effective treatment that is provided with regard for your overall health and well being. Facebook fans 60. Twitter followers 6. Tampa, FL About Blog Healthy Feet Podiatry is a Podiatry Practice based in Tampa and Brooksville Florida. Podiatrists, Dr. Krawetz & Dr. Brennan specialize in conservative and surgical treatment of the foot and ankle in North Tampa, Brooksville, & Wesley Chapel. Facebook fans 298. Twitter followers 4. Tucson, Arizona About Blog Dr. Bocian specializes in podiatric medicine and surgery. He offers the most up to date treatment options for a variety of conditions of the foot including heel pain, hammertoes, bunions, plantar fasciitis, neuromas, flat feet, and diabetic foot care. Facebook fans 189. Twitter followers 1. Wayne, New Jersey About Blog This is the podiatry blog for Wayne Foot and Ankle Center of Wayne, NJ and Hewitt, NJ. Wayne Foot and Ankle Center provides diagnostic and treatment procedures for foot and ankle problems. Facebook fans 70. Twitter followers 217. Marietta, Georgia About Blog Dr. Fui is the best podiatrist in Marietta, GA. Our foot and ankle specialist podiatric services include conservative treatments, surgery, and pain management. Facebook fans 437. Twitter followers 918. Oklahoma City, Oklahoma About Blog Read Dr. Darren Elenburg's blog to learn more about the latest in foot conditions and care, including prevention, home treatment tips, and more. Facebook fans 397. Twitter followers 339. Columbiana, Ohio About Blog Advanced Podiatry, treating foot and ankle pain in Austintown, Columbiana, Cortland and Warren, Ohio. Facebook fans 18. Twitter followers 4. Neutral Bay, New South Wales, Australia About Blog Katie Nilan Podiatry is the trusted specialist in foot care for Neutral Bay, Cremorne, Mosman, Kirribilli, Cammeray and the surrounding suburbs of the Sydney's Lower North Shore. Dearborn, Michigan About Blog Podiatrists, Dr. Mayer Salama and Dr. Daniel Salama offer 4 convenient office locations in the Dearborn, Farmington Hills, Clarkston and Trenton, MI areas. Call to make an appointment today!es and services in the MI area. Greensburg, PA About Blog At Westmoreland Foot & Ankle Care, LLC, our priority is to deliver, friendly, efficient care based on our vast knowledge of foot and ankle conditions. We are an independent practice accepting most insurances. From skin and nail conditions, to orthopedic deformities, heel pain, and fractures, we are the go-to location for your foot care needs in Westmoreland County, PA.
Facebook fans 23. Twitter followers 7. Astoria, NY About Blog Our mission is to provide you with the highest medical and surgical quality of care of the foot and ankle in a safe and effective manner, while providing a professional and compassionate environment. Our goal is to make patients feel relaxed and comfortable, while educating patients about their condition and their plan towards healing. Facebook fans 289. Twitter followers n/a. Bethesda, Maryland About Blog The APMA is dedicated to promoting foot and ankle health, member service and professional excellence. Get updates on APMA events, news and more! Facebook fans 38,202. Twitter followers 38,256. Marietta, Georgia About Blog Podiatry Group Of Georgia, is a Marietta Podiatrist specializing in podiatric procedures, diabetic foot care and other services in Marietta and Atlanta GA.
Facebook fans 3,272. Twitter followers 994. Newmarket, QLD About Blog Pivotal Motion Podiatry offers caring advice and specialised treatment to suit your specific condition. Facebook fans 1,685. Twitter followers 501. Pukekohe, New Zealand About Blog Step Up Podiatry offers affordable podiatry care. Catering to all foot problem for all ages. Our podiatry clinic is located in Pukekohe, Auckland and is your one stop shop for all your foot problems! Facebook fans 1,494. Twitter followers 17. Fort Collins, Colorado About Blog Anderson Podiatry Center is a leading foot and ankle clinic specializing in treatment of neuropathy, heel pain, and bunions. Facebook fans 1,275. Twitter followers 96. Perth, Australia About Blog The Perth Foot & Ankle clinic provides a comprehensive podiatry service, including general podiatry, biomechanics, diabetes care, children's foot problems, treatment of sporting injuries and foot surgery. Our blog explores different foot problems from the perspective of experienced Perth podiatrists. Facebook fans 1,139. Twitter followers 28. Adelaide About Blog myPod Podiatry Adelaide based podiatrists offer quality care for sports injuries, orthotics, children, and foot and heel pain. Facebook fans 982. Twitter followers 75. Toowoomba, Queensland About Blog Keep up to date with everything to do with Toowoomba Podiatry, feet and fun. Keep up to date with everything to do with Toowoomba Podiatry, feet and fun. Facebook fans 814. Twitter followers 4. Chifley About Blog Canberra Podiatry is a state of the art podiatry clinic, we offer general treatments inc. laser treatment, biomechanical assessments and orthotic fabrication. Canberra Podiatry is a family owned and operated podiatry clinic centrally located in suburb of Chifley in Canberra, ACT. Facebook fans 482. Twitter followers 397. Melbourne, Victoria About Blog Sole Motion Podiatry clinic provides a wide range of podiatry services including custom orthotics, sports, laser, occupational, children & general podiatry treatments. Facebook fans 817. Twitter followers 77. Fayetteville, New York About Blog Syracuse Podiatry services the community of Fayetteville, New York by treating common foot and ankle conditions. Learn more about foot or ankle conditions that could be causing you pain. Facebook fans 581. Twitter followers 246. North Terrace, Kent Town About Blog Daniel Gibbs blogs about the interesting side of fixing your feet. At Posture Podiatry, they will help you find the true cause of your pain. Facebook fans 762. Twitter followers n/a. Tring, Hertfordshire About Blog Betafeet Podiatry offers expert assessments and treatments from fully qualified podiatrists. With over three decades of experience, our podiatry clinics in Tring and Hemel Hempstead have helped countless clients with accurate diagnoses of foot issues and innovative treatments, all performed with a friendly and professional manner. Facebook fans 295. Twitter followers 415. Lake Worth, Florida About Blog Kevin Lapoff, DPM is a Lake Worth podiatrist with podiatry offices in Lake Worth, Florida. Dr. Lapoff provides treatment for foot & ankle pain; conditions. Facebook fans 484. Twitter followers 49. Freehold, NJ About Blog Dr. Rose A. Caruso is a board certified podiatrist located in Freehold, NJ with years of experience treating conditions of the foot and ankle. Facebook fans 472. Twitter followers 54. Facebook fans 479. Twitter followers n/a. Solon, Ohio About Blog Read about interesting and educational topics related to the foot and ankle in this podiatry blog by the Foot & Ankle Associates of Cleveland. Facebook fans 366. Twitter followers 63. Crofton, MD About Blog Crofton Podiatrist, Brad Toll, DPM, is a foot doctor specializing in podiatric procedures and services in the Crofton, MD area. Facebook fans 99. Twitter followers 249. Warragul, Victoria About Blog The Podiatry Group treat all Podiatry conditions in Drouin Warragul and Cranbourne. We manage skin and nail problems, orthotics, sports injuries and surgery. Facebook fans 322. Twitter followers n/a. Miranda, New South Wales, Australia About Blog The Podiatry Centre is a medical grade health centre that treats painful foot and leg problems. Here you will find informative and useful postings about podiatric care. Facebook fans 284. Twitter followers 31. Airdrie, North Lanarkshire About Blog Feet First Podiatry is providing a solution for all your foot problems. Lesley Coyne is the owner of Feet First Podiatry and is able to offer a full range of podiatry treatments either in our shared clinic practice or in the comfort of your own home. Facebook fans 287. Twitter followers n/a. Centerville, Ohio About Blog The blog at Sunshein Podiatry Associates provides people of Centerville and surrounding areas excellent advice on foot and ankle care. Facebook fans 194. Twitter followers 68. New Albany, IN About Blog New Albany Podiatrist, Zahid Ladha, is a foot doctor specializing in podiatric procedures and services in the New Albany, IN area. Our mission is to provide compassionate, comprehensive, informative, expert medical and surgical care of the foot and ankle that meets and exceeds the expectations of those we treat. Facebook fans 270. Twitter followers 1. Kew, Victoria About Blog At Kew Podiatry and Sports Centre, we have extensive and leading experience in all aspects of physiotherapy, podiatry and lower limb healthcare. With our drive and passion to aid in peoples health, we utilise the best evidence based practice and clinical experience, to deliver industry leading healthcare. Facebook fans 254. Twitter followers n/a. Point Cook, Victoria About Blog At the Foot Clinic, we strive to keep you on your feet. With treatments available at both Point Cook and Yarraville, the aim is to provide best possible Podiatric care. Facebook fans 228. Twitter followers 3. Downingtown, Pennsylvania About Blog At Your Next Step, our board certified podiatrists are committed to providing the utmost foot & ankle care in the Ardmore, Paoli and Downingtown, PA area. Facebook fans 106. Twitter followers 112. About Blog At Your Podiatry Room, we are dedicated to providing evidence-based treatment in a genuine and caring environment. Foot and ankle rehab, performance and treatment. Ingrown toenails, Diabetic foot, fungal nails, children's feet. New York, NY About Blog At Starrett Podiatry, our priority is to deliver quality care to informed patients in a comfortable and convenient setting. We treat a variety of ailments and injuries, including Heel Pain, Bunions, Diabetic Foot Care, Ingrown Toenails, and much more. Facebook fans 165. Twitter followers n/a. Anderson, South Carolina About Blog Palmetto Podiatry Group has foot doctors that specialize in foot, ankle and heel pain treatments in Anderson, SC area. Facebook fans 152. Twitter followers 9. Andover, MA About Blog Institute for Podiatric Excellence & Development (IPED) helps students, residents, new practitioners and veterans maximize success in podiatric medicine. Facebook fans 106. Twitter followers 47. South Deerfield, MA About Blog At the DeCaro Total Foot Care Center, our priority is to deliver quality care to informed patients in a comfortable and convenient setting. Here you can read and learn about topics related to foot health information written by the foot specialists. Facebook fans 121. Twitter followers 11. Lee's Summit, MO About Blog Read up on the foot and ankle care information from the blog of your Lee's Summit, Missouri podiatrist, Joel D. Foster, DPM. Alexandria, Sydney About Blog Read our podiatry blog and keep up to date with all things foot related from The Foot Hub. Facebook fans 128. Twitter followers 7. Centreville, VA About Blog At Clifton Foot and Ankle Center P.C., our priority is to deliver quality foot care to informed patients in a comfortable and convenient Centreville setting. Facebook fans 65. Twitter followers 55. San Diego, CA About Blog Dr. Falk is a concierge podiatrist that specializes in sports medicine & cosmetic procedures. Sports Medicine & Cosmetic Podiatrist. Licensed in California & Nevada. Facebook fans 105. Twitter followers 12. Wayne, New Jersey About Blog Read our blog to learn more about common foot and ankle conditions that could be causing you pain today! Dr. Russell Samofal, Board Certified podiatrist and foot surgeon in Wayne, NJ specializes in foot and ankle treatments and surgery and diabetic foot care. Facebook fans 41. Twitter followers 66. West Ryde About Blog Healthy feet mean a healthy you! At West Ryde Podiatry Clinic we make sure your feet are healthy. Indianapolis About Blog Indianapolis AHP Diabetic Foot and Wound Care provides wide range of podiatry care with focus on diabetic foot care and lower extremity wound care. They also provide house calls for those that are home bound or home limited. Blackwood, South Australia About Blog Blackwood Podiatry is dedicated to providing high quality podiatric care. Their mission is to provide quality and caring podiatry services to keep you on your feet. Torrance, California About Blog Torrance podiatrist group Precision Foot and Ankle Centers are proud to be serving Torrance, CA & other locations. Facebook fans 34. Twitter followers 2. Oceanside, CA About Blog Dr. Clifford Wolf is a Podiatrist in Oceanside, CA. Wolf Podiatry focuses on the evaluation and treatment of Foot, Ankle & Lower Extremity injuries, deformities and disease. Dr. Wolf’s passion is to eliminate foot pain without the need for invasive surgical procedures, in order to get people back to work and active in their daily lives – walking and exercising without pain. Canberra, Australia About Blog We assess and treat all ages for foot conditions such heel and arch pain, ball or foot pain, bunions, corns and callous and ingrown toenails. Arlington, Virginia About Blog This website is here to provide you with an overview of our practice and with the field of podiatry. Foot pain can be toe pain, related to gout, arch support or ankle arthritis in Arlington VA.
Waterbury, Connecticut About Blog At Performance Foot & Ankle Specialists, LLC our focus in on helping athletic and active Waterbury and Newtown area patients achieve optimal foot health. Facebook fans 9. Twitter followers 1. Valley Stream, NY About Blog Valley Stream Podiatry, Foot and Ankle Doctors, provide podiatry services in the office, local surgery centers, hospitals, nursing homes and long-term care facilities, and, when appropriate, for select home-bound patients. Facebook fans 6. Twitter followers 3. Venice, FL About Blog Venice Podiatrist Charles Sulesky providing quality foot and ankle care. They treat everyone from infants to seniors, providing both non-surgical and surgical options for foot and ankle conditions. Facebook fans 6. Twitter followers 1. Wayne, New Jersey About Blog At Atherton Road Podiatry Centre, we have extensive and leading experience in all aspects of podiatry and feet healthcare. Atherton Road Podiatry Centre is here to provide residents in Melbourne’s south-eastern suburbs with professional foot doctors. Lymington About Blog The Chiropody Surgery is a business offering foot care from professional podiatrists / chiropodist in Lymington, Hampshire. Nambour, Queensland About Blog FootSmart is the healthiest place online for your feet! We've got the ultimate footwear and accessories to keep you moving in comfort every single day. Facebook fans 55,238. Twitter followers 2,084. 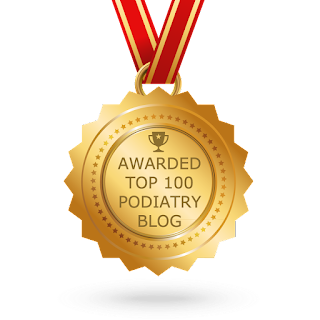 CONGRATULATIONS to every blogger that has made this Top Podiatry Blogs list! This is the most comprehensive list of best Podiatry blogs on the internet and I’m honoured to have you as part of this! I personally give you a high-five and want to thank you for your contribution to this world.